Citizen Ship is a portable pavilion designed as a public meeting place and with a resemblance to Milton Keynes bus shelters. 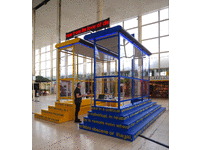 The artwork is part-public sculpture, part-kiosk and part-publishing laboratory. Citizen Ship extends the concept of participation in art by engaging new groups in the production of collective artworks that are displayed in and on the structure. Through conversations visitors and passer-bys developed new slogans and published them by making badges, vinyl lettering, ribbons and teletext messaging. The participatory art methods applied are directed at opinion formation in order to understand how communities create and perform collective values. Citizen Ship, was funded by Arts Council England and Milton Keynes Art Gallery. 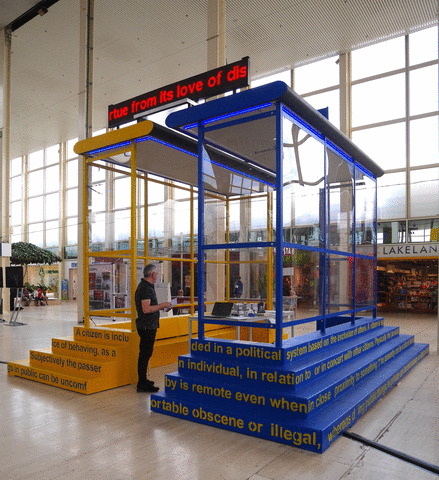 Citizenship Plinth Text: A citizen is included in a political system based on the exclusion of others. A citizen is legally acknowledged as belonging to a state or nation or community. Citizenship is the practice of behaving, as an individual, in relation to or in concert with other citizens. Physically, the passerby is a body that moves and keeps on moving rather than becoming an observer, onlooker or participant. Subjectively, the passerby is remote even when in close proximity to something. The passerby can be a citizen but does not practice citizenship. In contrast with the private, the public is a form of exposure to others. Doing private things in public can be uncomfortable, obscene or illegal, whereas doing public things in private can be exclusionary or elitist or corrupt.